Saturday night, Mercy Ministries was honored to have special guest Millard Fuller come and speak to the girls in the Nashville home. Millard founded Habitat for Humanity International in 1976 and served in executive roles until 2005. In 1996, former U.S. President Bill Clinton awarded Fuller the Presidential Medal of Freedom, the nation’s highest civilian honor, calling Habitat “…the most successful continuous community service project in the history of the United States”. Fuller also has authored nine books about his life and work with Habitat for Humanity. During his time at the home, Millard challenged the girls to seek God with all of their hearts. He shared about how important it is to put God first, even if that means giving up everything. 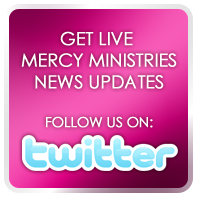 The girls were encouraged as they have all had to let go of things in their own lives in order to come to Mercy Ministries. For more information about Mr. Fuller or Habitat for Humanity, go to www.habitat.org/how/millard.aspx.